There’s unlikely to be an event that you’ve attended that wouldn’t have employed security guards and door staff to keep everything running smoothly. You’ll find them at football matches, music festivals and concerts, as well as evenings at a nightclub. If you are running an event of any kind, ensuring you have security measures in place is vital for protecting everyone attending the event, as well as the valuable equipment being used for it. When planning an event, it is likely that a risk assessment would have been conducted to highlight the need for some form of security service. From crowd control to emergency situations, the team at W4G Security Services have expert security guards and door staff you need to ensure a secure and safe event. Door staff are important at events to regulate those coming in and out of the venue, which both helps to keep the numbers inside at a safe level and to prevent any unwanted intruders showing up. They can also perform meticulous bag searches for any unlicensed substances or weapons, which is becoming more and more important as in 2018 there was a 16% rise in knife-related crime. Door staff are also required at events where there is alcohol being served in a public place and this must be implemented before the event begins. 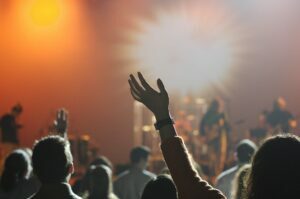 The exact regulations concerning security and alcohol consumption will vary depending on the type of event you are hosting and the venue in which it is being held, so it is important to consider this in your planning process. This is another area of event security that is easily managed by skilled security guards as they help to keep everything calm in often disruptive or violent behavior and therefore to keep everyone safe. Security guards can offer support and assistance for anyone who is disabled, as well as monitoring people in distress or those who fall ill and to organise help for them. 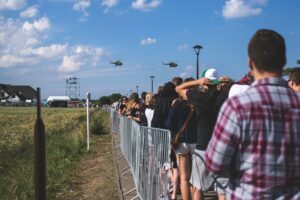 The type of crowd control service you require will vary depending on your event, but W4G Security can provide a bespoke security service to suit your needs. Should your event call for it, there is a chance that you will be hosting some high profile guests, and security guards can ensure the personal safety of the guests who are attending. It is possible that these people may bring their own security teams, but it’s better to provide a close protection service just in case to maximise security and to ensure their safety, especially in busy situations. There will be times where emergency security is required at an event, and fortunately our security guards are flawlessly trained in dealing with emergency situations. Whatever the threat or situation, our security service can effectively take control and deal with the problem efficiently whilst ensuring the safety of your guests at all times. No matter how big or small your event is likely to be, security is vital and must be taken into account during your planning process. W4G Security Services offers SIA licensed security guard services in Devon and London to cater for all your event requirements. Our bespoke services are highly valued across the UK and are available to secure your events year-round. To find out more, contact us today.